Despite some obvious shortcomings, 91 year old director and writer Arthur Laurents has proven that you can’t kill a masterpiece. That masterpiece happens to be West Side Story. The Leonard Bernstein score, Stephen Sondheim lyrics and Arthur Laurents’ book, based loosely on Romeo and Juliet, still has the power to give you chills and draw you into the love story between two members of warring rival gangs. When originally produced on Broadway, Brooks Atkinson in his 1957 NY Times review called the material “horrifying.” Today’s audience would hardly be “horrified.” There were even some awkward titters to be heard in the audience during some inappropriate moments. Yet this evening’s audience was still deeply moved by the production. It took until the final scene of act one, the rumble, for me to be pulled into this production. Part of this was due to some poor casting choices among the Jets. Frankly, some of these boys would be more threatening with a curling iron than with a switch blade. Another critic referred to them as looking as though they just jumped out of a Gap commercial. Frankly, my analogy would lean more towards the “Mickey Mouse Club.” Some of the earnestness of the young actors stood out like a sore thumb. The smudged “dirt” on their faces only served to further give portions of the production a tone of amateurishness. That said this cast dances the Jerome Robbins choreography, recreated beautifully for this production by Joey McKneely with precision and energy. Tony is played by Matt Cavenaugh, seen in last season’s A Catered Affair as well as Grey Gardens and Urban Cowboy, both from a couple of seasons ago. Cavenaugh sings the songs with a pure unforced voice that floats out of him. You don’t buy into his character until the end of the first act as well. From there on he shines. Argentinean native Josefina Scaglione plays Maria. She has a lovely voice though it never quite lives up to the hype and at times was actually slightly off pitch. Despites some other critic’s reviews which felt there was more to her voice than her acting, I felt she handled herself beautifully as an actress and actually was even more convincing when singing. The material gave her more than enough opportunity to win you over. 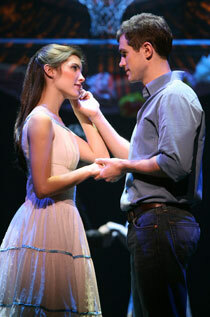 “One Hand, One Heart” was delicate and impassioned and “Somewhere” left you with chills. Karen Olivo as Anita is the show’s tour de force and emotional realist. Her fear is palpable in the drugstore scene with the Jets in the second act. She has a fierce voice and a commanding presence. She is paired with Cody Green who gives a terrific performance in the role of Riff. Kudos to Arthur Laurents for taking a chance, presenting sections of the show in Spanish (as translated by In the Heights’ Lin-Manuel Miranda). I’m sorry to say it doesn’t work. It’s distracting and irritating, particularly when used at length for major plot-sensitive scenes and songs. The two numbers that are done almost exclusively in Spanish are “I Feel Pretty” and “A Boy Like That.” The latter was a particularly poor choice to throw at what I’m sure are a large number of non-Spanish speaking audience members. Some of the audience tonight were kids who I’m sure have never seen this show. Mr. Laurents does his production and his work a disservice by making this choice. Had any other director attempted to do that in this manner, he couldn’t have been forgiven nearly as easily as we can forgive Laurents (being the original author of the book). The set, by James Youmans was minimalist and unobtrusive. His scenery for the rumble scene at the end of act one was particularly effective and impressive. The real star of this production is the Leonard Bernstein score and Jerome Robbins choreography. The orchestra, with a full complement of violins and cellos is under the direction of Patrick Vaccariello. My hat is off to the producers of this show for giving the Bernstein score the instrumentation it needs, you got your moneys worth. Looking around me at the show tonight I saw a sea of young faces. How encouraging to see the next generation experiencing a true American classic in the musical theatre repertoire. This production deserves to run and if the audience tonight was any indication, it will do just fine. 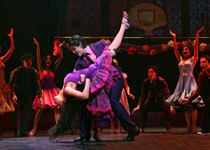 West Side Story is playing at the Palace Theatre, 1564 Broadway. Get tickets. In his review for the NY Times, Ben Brantley calls the attempt to translate some of the songs and dialogue into Spanish “an only partly successful experiment.” His chief complaint questions the wisdom of translating certain plot-driving dialogue into Spanish. “It’s fine for those of us who know the show inside out, but English-speaking newcomers may have difficulty following the second act.” On the prevailing spirit of the show, “a tenderhearted awareness of the naked vulnerability of being young and trapped in an urban jungle.” Read the full review. Linda Winer in her review for NY Newsday calls this latest production of West Side Story “neither revelation nor vandalism” and continues on to say “it’s still a wonderful show.” Except for Olivo she calls the cast “just all right” and the physical production “surprisingly conventional - modest in imagination if not in budget.” She felt the Spanish worked well in small doses but that “When entire scenes go by in another language, however, the audience feels as left out as the new immigrants.” Read the full review. In the review for the LA Times Charles McNulty asks the question “Are these hoodlums heading to a brawl or a Juilliard audition? “ In speaking of the show in general says “Laurents’ uneven production may be noteworthy for the way characters slip in and out of Spanish, but the show continues to seduce in a theatrical language that remains universal.” Read the full review. David Rooney for Variety wrote that under the direction of Lawrence “the 1957 show remains both a brilliant evocation of its period and a timeless tragedy of disharmony and hate.” His opinion regarding the translation of some of the book and lyrics into Spanish was more positive than other critics, including this one. “Audiences with no knowledge of Spanish will hardly feel adrift, however, in that the stakes in this urban "Romeo and Juliet" update are rendered more lucid by the dramatic integrity of the staging. And the feelings of lovestruck joy conveyed in "I Feel Pretty," or of bitter sorrow dueling with the conviction of the heart in "A Boy Like That," all but transcend words.” Read the full review.